This gift card will be shipped to the address of your choice via Priority Mail Service ($7 shipping fee) . Please allow approximately 3 days for delivery. If you would like to purchase a gift card for an amount not listed here, please call us at (516) 378-7357. Present Gift Card to cashier when making a purchase. The amount of the purchase will be deducted from the balance for you. Present the Gift Card to cashier. The cashier will verify the balance for you. If lost or stolen, your gift card can not be replaced. Please take every precaution to protect your Gift Card. 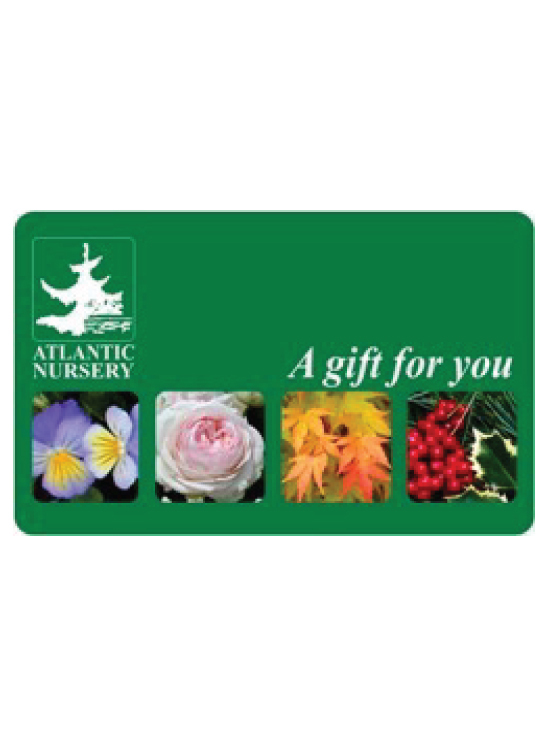 Atlantic Nursery Gift Cards have NO Card Activation Fee & NO Expiration for 5 years (60 months). NO administrative fee for 48 months from date of activation. After 48 months gift card will incur a 1/12 fee of remaining balance deducted monthly.